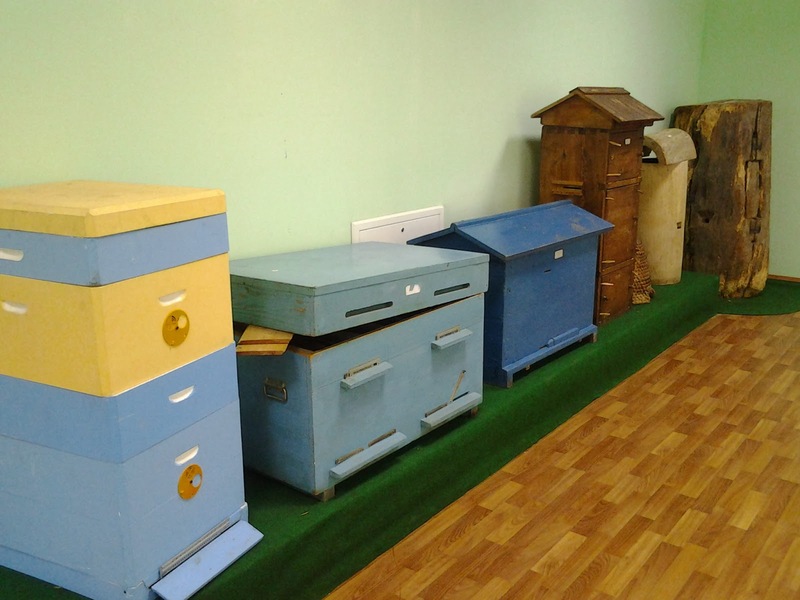 Off today to the Beekeeping Museum of the Ukrainian National University of Life and Environmental Sciences. In 1945, the Department of Beekeeping V.A. Nestervodsky, named after that prominent scientist was formed at the National University of Life and Environmental Sciences of Ukraine. Dr. Nestervodsky spent many years creating a teaching apiary, beginning in 1922, followed by Vasily Antonovich who turned it into a research program, which was inaugurated in 1961. In 1988, the beekeeping department museum was created under the leadership of Professor V.P. Polishchuk, who welcomed our small group to the grounds of the museum and department. Efforts of the program to help beekeepers include training and teaching in most aspects of the trade. The main technological accomplishments of the program include using instrumental insemination to produce an unique honey bee (Khmelnystsky) and molecular characterization of the races of bees currently found in Ukraine. The Department has close ties with the RDAU Moscow Agricultural Academy "K.A. Timiriazieva," and the Slovak Agricultural University in Nitra. Although there was no indication of the Department having hard times, at least one report in 2006 provided information that it might be under fire. That was seven years ago so perhaps things have turned around. Dr. Polishchuk did attend the event in Barischevka reported elsewhere in this blog. He clearly was warmly welcomed by the crowd. The museum featured displays of equipment and honey. Notable was the development of bee hives shown here. Left to right we see a log hive (gum), followed by a tall Prokopvych hive segueing into more modern boxes on the left. 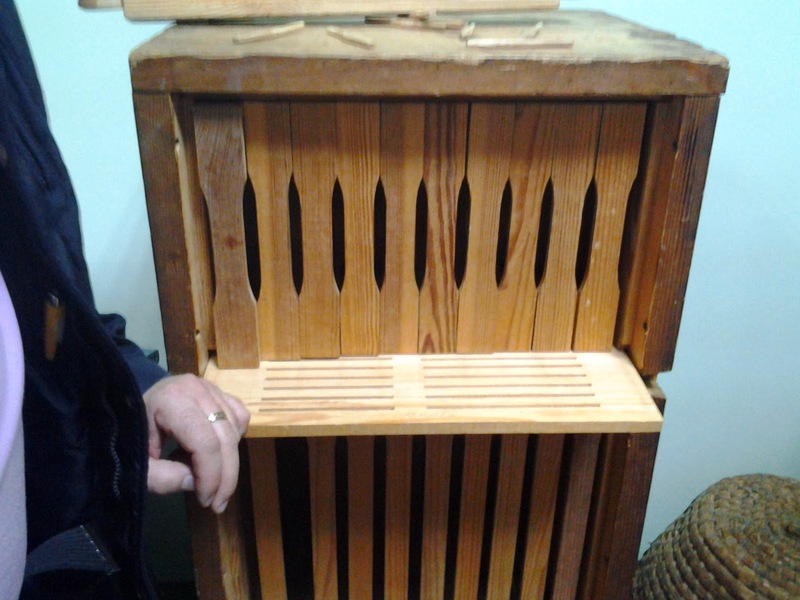 The Prokopvych hive is seen here in some detail. The frames look almost like Hoffman. Note the wooden queen excluder separating top from the bottom box. It seems that movable frames, employing the bee space, were already in use in Europe by several folks before Langstroth. Was he really the one who came up with the movable frame or did he just popularize it by developing a patent for a hive using this technology based on the bee space? Many scientific developments appeared on the scene together by different people who had minimal contact with each other, but usually only one gets much press. The bottom line is that the Langstroth hive in the U.S. standardized equipment, allowing much more extensive beekeeping to take place, not only in the U.S., but around the world.